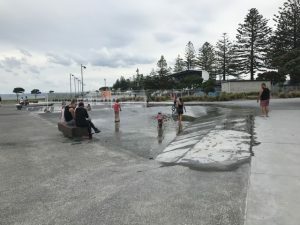 The walkway along the sea side of Napier’s Marine Parade is great for buggies, bikes, skate boards, scooters and rollerblades because it’s wide and mostly smooth concrete. Along the way there are plenty of things to stop and look at or play on making this an area you could easily spend half a day or more. Starting near the city centre, there’s the a covered wharf going out over the sea which is fun to peer off. Coming further south, there’s the Sunken Gardens which is great for a picnic and to get out of the wind if you’re after shelter. A little further down are fountains which kids seem to love running in and out of and then the enclosed paid skatepark with bowls, pipes and rails. There’s a grandstand for spectators and scooters, skates and skateboards for hire. See here for more details. This pathway then continues past Marine Parade playground the mini road bike park, the National Aquarium and on to the Bike Pump track. In fact this is only a small section of the track as it goes for over 10km from Cootes Rd, over the Clive River and beyond. There are various covered tables along the way and park benches as well as bbqs near the playground and toilets near the Dutch Waffle Ice cream hut (free) and the i-site (small charge). Address: Marine Parade, Napier. The cycle/walking pathway starts near Cootes Rd and heads south for a long way! There are various places to park along Marine Parade itself or small carparks at the main attractions.